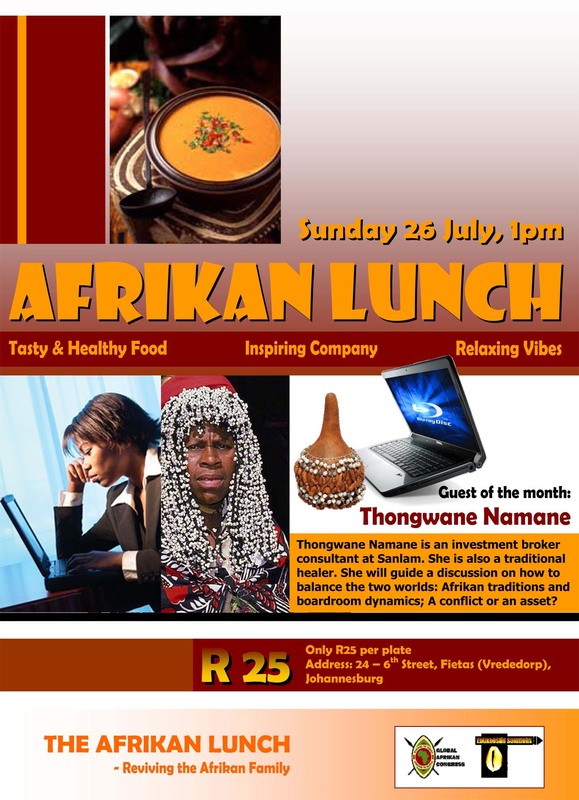 Once again Ebukhosini Solutions and GAC invite you to a refreshing serving of the AFRIKAN LUNCH on Sunday 26 July at 1 pm. If this is your first time, look forward to exceptional food, incredible people and an inspirational get-together. The AFRIKAN LUNCH is an informal lunch-event where you get your plate of healthy, delicious food for only R25, relax in the company of friendly people, engage in informal networking, while being soothed by the background sounds of Afrikan jazz/reggae/soul. Afrikan Lunch continues with the concept “Food For Thought & Soul” in the form of informal presentations and discussions. On 26 July we will explore the theme BETWEEN AFRIKAN TRADITIONS AND THE BOARDROOM; Afrikan Survival in the Corporate World. We want to ask if it is possible to merge the worlds of Afrikan traditions and modern business. Can one comfortably balance both, or do you have to compromise one over the other? Is it possible to be “conscious” in a corporate environment, or do you have to conform to a Eurocentric way of being? To guide this discussion we are delighted to introduce Sister Thongwane Namane. She is an investment broker consultant with Sanlam. She is also a traditional healer. How does she balance these two “portfolios”? Come and join in this discussion, share your opinion and raise your points! We look forward to seeing you at the Afrikan Lunch! Afrikan books will also be available for sale. Area: Close to Auckland Park, Braamfontein, Brixton and Fordsburg. WELCOME to THE AFRIKAN LUNCH; Reviving the Afrikan Family!